2018 was an incredible year for VST Plugins, as the world of virtual instruments continues to expand, the expectations of music producers is getting higher at the same time. Now that 2019 has fully kicked in, it’s time to kick back, prepare and gear up for the year ahead, so that you can make great music equipped with the best VST plugins for Hip Hop Production that are guaranteed to take your sound to new heights. The VST’s listed below will provide you with a broad range of sonic possibilities, including authentic live sounds, squelchy realistic hardware synthesisers, classic EQ’s, Vox Emulation, Utility Plugins and a whole bunch of original plugins that set VST’s from recent years look like entry level attempts. SlowMo slows down your mixes, instruments, vocals and even effect channels by 100% in realtime. Playback everything in half-speed with this easy to use effect plugin for windows and mac. Especially in modern productions such as hiphop and trap halfspeed has become a common effect. SlowMo´s built in oversampling makes sure the halfspeed version of your audio sounds as high quality as possible. The easy to use interface can be resized seamlessly to make it look great in every resolution in your daw. KHORDS is a focused instrument that brings sampled personality and classic character to your productions. With 550 inspirational chord presets at your fingertips, it’s never been easier to get mix-ready tones straight into your tracks. The huge sound library is stocked with stabs, plucks, strums, pads, atmospheres and tons more creative sources, letting you instantly inject new feeling into any genre of music. With the diversity and quality of Loopmasters’ sampling pedigree onboard, Khords is guaranteed to hit the spot every time. Choose from major, minor and single note categories, and browse for any instrument combination that works for you. Khords’ random selector keeps with the same major/minor feel, so you can try new setups without losing tonality. 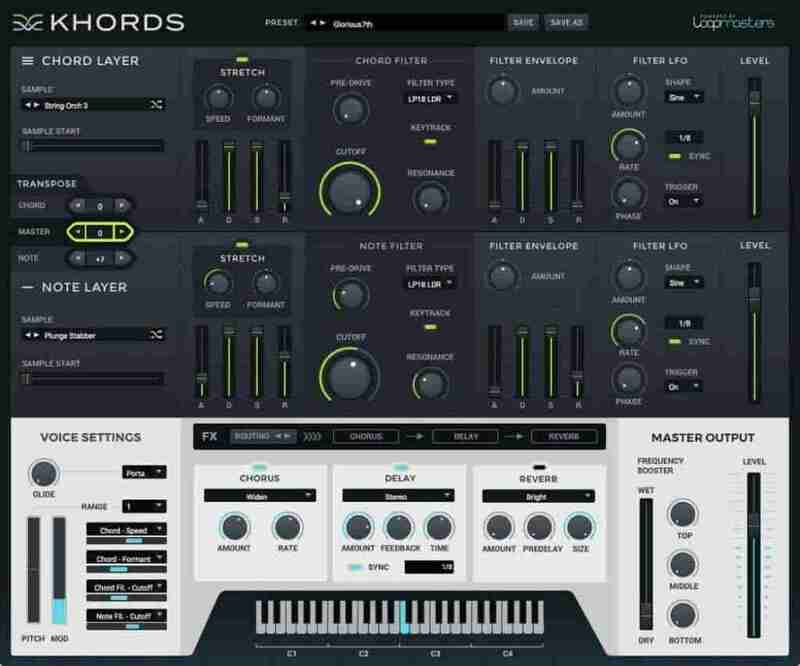 Khords’ synth engine is intuitive but powerful, offering real-time audio warping to control the pitch and timing of samples, 12 filter types, amplitude and filter ADSR, LFO, and effects to bring extra character to your sound. KHORDS is NOT currently available in AAX format. Please download the demo to ensure it works on your system before making a purchase. Spire is a polyphonic software synthesizer that combines powerful sound engine modulation and flexible architecture, and a graphical interface provides unparalleled usability. Spire is the embodiment of the best opportunities, within software and hardware synthesizers. Surprisingly user-friendly and fun to use! 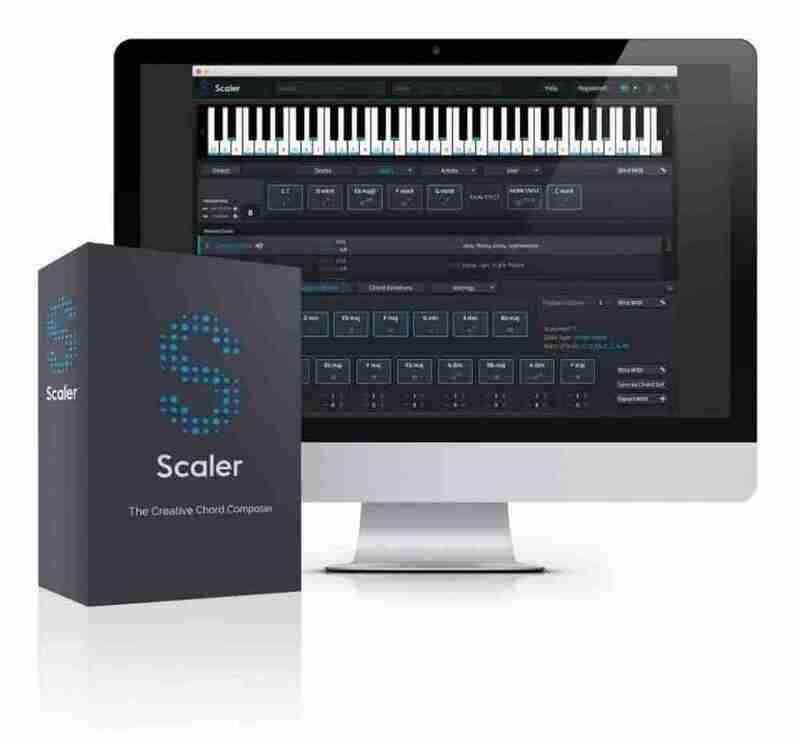 A first of its kind, Scaler can determine what key and scale you’re in and suggest chords that match your music, or it can inspire a tune from scratch by providing a set of initial chords in an unexplored key. 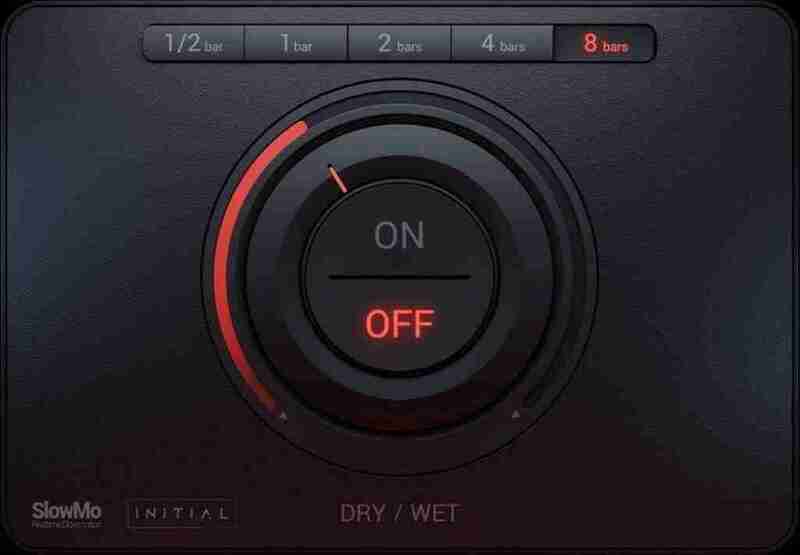 With the onboard bank of over 2,000 scales and modes including genre and artist presets, there’s more than enough to keep the juices flowing. Once you’ve determined a scale, Scaler lays out basic diatonic chords for you to audition, and lets you take things further with dozens of chord variations and voicings to try out. Theory buffs can also get an insight into each chord’s harmonic function. Ready to put together a progression? Simply drag and drop chords into Scaler’s sequencer, change up octaves and inversions, edit the voicing, and record or drag the progression into your DAW. Scaler is a plugin instrument capable of outputting MIDI as well as audio. With regard to the latter, a piano, guitars, strings and several sampled synth sounds are built in for scratch work, so you can quickly get a chord progression together for export as a MIDI file entirely within it. Obviously, though, the idea is to trigger other instruments via Scaler, and how this is set up depends on the host DAW. For VST hosts, Scaler loads as an instrument plugin onto a MIDI track, the output of which is sent to a second track (hosting the target instrument) using the DAW’s routing system. For Audio Unit hosts (ie, Logic Pro), the included ScalerControl MIDI effect plugin is loaded up instead. This is identical to the regular Scaler, but sits in front of the target instrument on the same track, outputting MIDI directly to it. It’s certainly the more elegant of the two approaches, although it only captures the raw triggering notes to the track, not the chords output by the plugin. Discover the magic inside your drum loops which you’ve wanted to extract for years. Create new sounds from old or simply adjust the volume of individual elements inside a loop. Regroover uses Artificial-Intelligence to extract layers from within your previously recorded beats and samples. Once Regroover analyses the audio file, you are able to make your own drum kits and combine external sounds to make new beats, loops and your own unique Expansion Kits. Unmix your loops into distinct sound layers. Get previously unreachable sounds from inside your loops. Craft the isolated beat elements and form your unique rhythmic signature. Or Build your own Expansion Kit with any element inside your loop which makes for rapid-fire MIDI triggering of samples to make new beats and grooves. Create Regroover Projects with both external and found sounds from inside your loops. 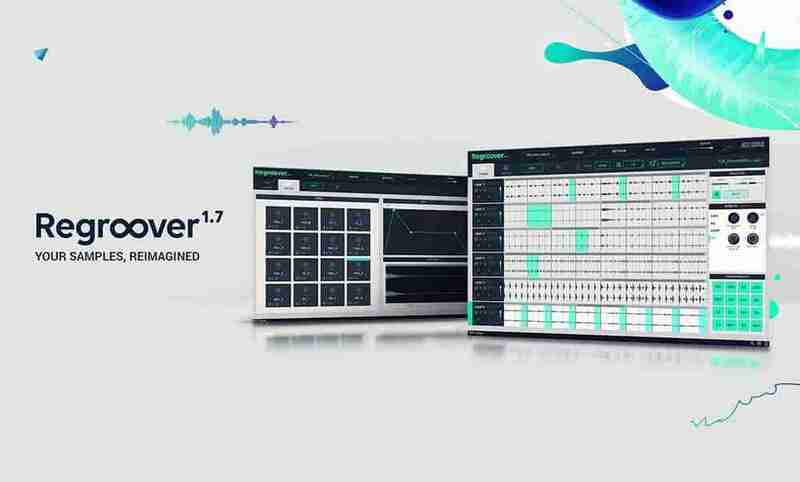 Regroover is for music producers, beatmakers and DJs who use sampling, drum programming, and beat slicing to remix and compose. Who should never use Regroover? Musical snobs who don’t like fun sample manipulation tools and new ways to work with samples. Free yourself from traditional sampling limitations. Grab the live vibe of an isolated hi-hat pattern or extract that punchy snare you always wanted. Regroove your old sound libraries and produce astonishingly-fresh tunes. Use Regroover’s MIDI functionality to create inspired beat variations you can remix on the spot. Craft the sound of individual sound components and add your favourite effects. Swap kit elements of the original groove with new ones. Play around with the A.I. engine and obtain new, previously unheard sounds. Reveal and capture the underlying micro-rhythms and hidden tempo patterns of each audio clip. Diversion offers 4 oscillators with a wide range of different waveforms with a near to zero level of aliasing. The oscillators generate sounds in real-time by using our algorithms, which don’t degrade the sound quality at high frequencies. All waveforms have two independent parameters X and Y allowing you to adjust the timbre of the produced sound. The oscillators also feature such synthesis techniques as FM, RM, wave shaping and filtering. Two bus processors in Diversion allow you to transform the oscillators’ output into a wide variety of possible sounds. Each bus processor consists of a stereo filter with lots of different modes, distortion and LO-FI section. We have implemented many filter modes and types of saturation stages to bring you a great armoury for creating arbitrary patches, including popular Trance, Psy, Dub Step and Ambient sounds. 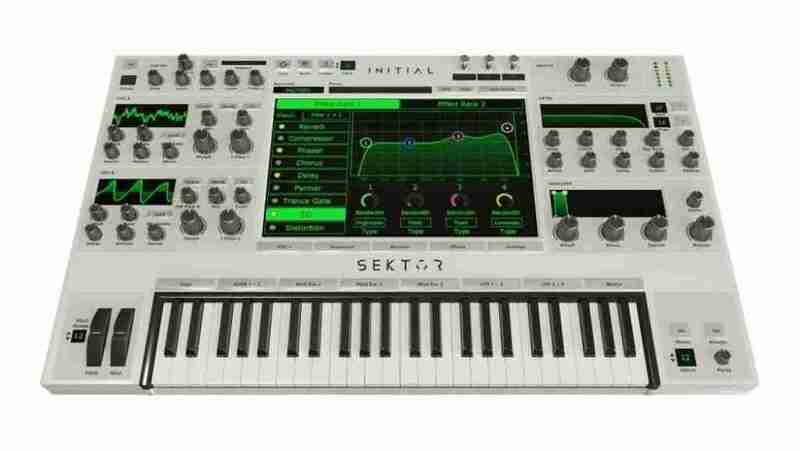 Sektor is a polyphonic wavetable synth plugin with a highly intuitive user interface and a lot of customization features. Sektor was built to use a low amount of system resources while having a massive high-quality sound. Advanced modulation features such as feature rich modulation Envelopes, ADSR´s and LFO´s can be routed to the synths parameters via drag and drop, or via the right-click menu of the knobs. The modulation matrix gives you even more access to features such as velocity, aftertouch and much more. Shape each parameter of 16 voices per wavetable oscillator with OSC+. Create massive unison sounds and change the waveform, phase, pitch, stereo spread, level and detune of each individual unison voice. Sektors built-in Heat Up 2 multisample engine let you combine the real sound of a modern rompler with Sektors advanced wavetable synthesis engine. 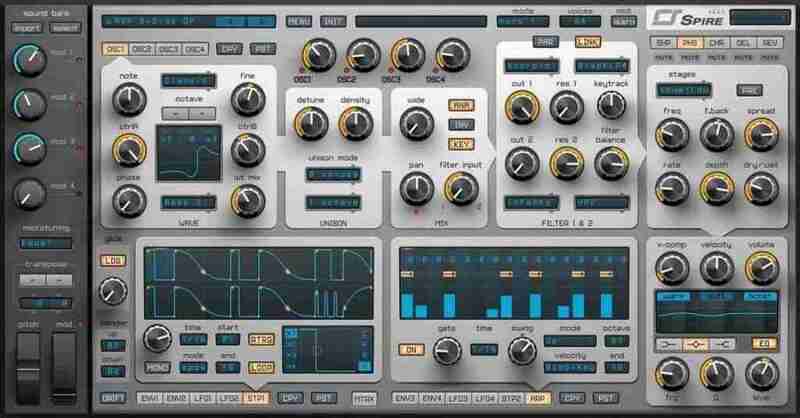 Sektor also comes with two effect racks including effects such as reverb, delay, distortion, chorus, phaser, trance gate, compressor, stereo shaper and a 4 band equalizer. The order of the effects can be rearranged via drag and drop. Sektor was made to be deeply customizable, offering many features to make it your own. Change the colours, backgrounds, skins and more. Create custom-made arps and sequences with the built-in sequencer, create your own skins, add your own samples, create your very own presets, expansion packs and much more. Offer your content to others or share it with your friends. Sektor comes with a highly intuitive and unique interface design, making it very easy to use and understandable. Even if you are not very experienced in synthesis you can achieve great results and fast. Modern drag and drop features make the modulation matrix almost unnecessary. Sektor also gives permanent visual feedback, helping you to understand what is happening with each preset. Not sure what a control does? Hover over each control for a tooltip explaining the feature. The Factory Library comes with over 750 unique presets which will suit a broad range of genres such as EDM, Hiphop, Trap, RnB, Dubstep, Drum N Bass and much more. With over 200 factory wavetables, 100 multi sampled instruments, over 250 single samples and dozens of Sequencer presets you will have plenty of content to craft your own unique sound. Edit Wavetables and Waveforms with the built-in Wavetable Editor or create your own Wavetables from scratch. Built in sampler engine with hundreds of samples. Also plays back Heat Up 2 Instruments. Lifetime free updates. Pay once and get all future updates for free. Welcome to MOVEMENT, an exciting and powerful effects engine that adds simple to mind-bending rhythms to any input in real time – from guitars and keyboards to synths, pads, drums and even full mixes. Built equally for studio use and live performance, the creators of EXHALE, SIGNAL and REV bring you a tool that pushes the possibilities of your music. With LoFi we have decided to create an easy to use yet versatile plug-in that will enable you to achieve a similar sort of sound influenced by artists ranging from Boards of Canada and Burial to Clams Casino and Brian Eno. You will find over 200 dirty, atmospheric and sometimes beautiful instruments all lovingly mangled, re-sampled and processed through an MPC60 MKII, a Fostex M80 Reel to Reel and various analog outboard effects to nail that cool LoFi vibe. To obtain that classic, LoFi vintage sound, its not necessarily the instruments or samples that creates the overall vibe but the way they were recorded or processed afterwards. A pristine, lifeless piano once recorded into a 12Bit MPC, treated with a touch of dirty reverb, lush tape delay then saturated with a vintage pre-amp soon takes on a character of its own. This collection of sampled and re-pitched pads, real world recordings, chopped vocals and quirky leads will sure to inspire your own creations. The first 50 presets are devoted strictly to the grimey sound of the Akai MPC 60 MKII, famous for its full bodied mid tones, coloured saturation and narrow 40khz range. When recording entered the digital age and virtual instruments were introduced it seemed as though traditional analog synths would be deemed surplus to requirements. No more having to patch leads in, the cost difference, easier to recall past sessions, preset patch management and a many more benefits but…twenty years later we’ve realised that the full bodied sound, almost 3D presence and unmistakable warmth of analog devices just can’t be recreated in the digital domain (so far). With this in mind, we have taken a collection of weird analog sounds and processed them with plenty of dusty atmosphere and unique character. The second 50 presets represent just some of the huge range of analog and acoustic sounds possible from a variety of vintage synths, home made tone generators and recorded sounds. Even with the many good (and bad) tape emulation plug-ins available to producers, you just can’t beat the real sound of tape. Whether its a well maintained Reel to Reel, an old school tape deck or even a worn out VHS recorder, the unavoidable hiss, subtle wow/flutter and all round dopeness is a blessing in today’s digital world. 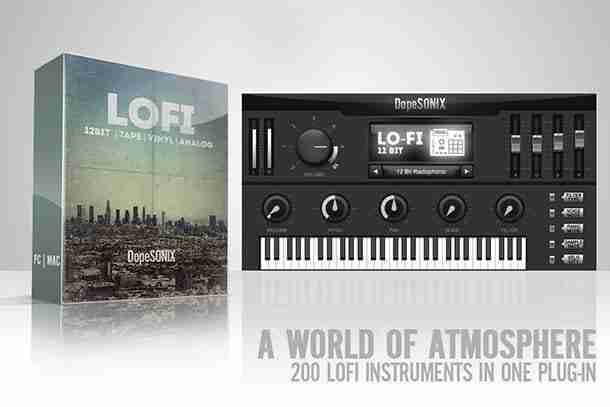 We have hopefully succeeded in bringing you a collection of awesome instruments perfect for any producer of LoFi Hip Hop, Chill Hop, Ambient even Dnb and Electronica!. The next 50 fantastic presets includes everything from old cinematic strings and outer world textures to haunting leads and grungy pads. It seems, regardless of the new digital formats hardware companies thrust upon us, vinyl will just not go away. In fact, year on year vinyl’s popularity is growing and that’s down to one main reason. The sound of vinyl is in our opinion, unbeatable. We believe its the combination of the dusty crackles, imperfect playback, limited yet strangely full audio range and the hard to describe feel you get when the needle goes down into the groove. The final 50 presets include chopped style samples, crackly synths, warped vocals, mysterious leads all coated in atmospheric dust and vinyl noise. 200 LoFi / Chill Hop / Ambient / Electronica inspired instruments. Mono, Poly and Legato modes. Soft, Normal and Hard velocity modes. Introducing Virtual Bassist MELLOW – a double bass playing jazzy acoustic hipster that provides body, texture and a big bottom end. As with every UJAM Instruments product, MELLOW benefits from our frustration-free design philosophy meaning anyone can use this product to make music faster, better and easier, regardless of their music production experience level. Real recorded room adding amazing ambience without the mush. Just follow the simple controls on the user interface to easily trigger one of over 40 styles and 450 phrases to use in your tracks. Add the final bit of sheen with MELLOW’s simple yet powerful set of tone sculpting controls with separate parameters for many useful sonic and performance-enhancing features. Experiment with amp selection, dial-in instant character changes, note vibrato level, room reverb level, octave effects and not to mention dynamics and EQ. Virtual Bassist MELLOW has two distinct modes – Firstly, Player mode, that gives you easy access to UJAMs traditional fail-free GUI and control set, just set the musical key and decide on the chords of the song and MELLOW does the hard work, even intelligently choosing the most appropriate articulations to augment your basslines. For those that want more control and are comfortable playing the keyboard, our brand-new Instrument mode will let you access the whole of MELLOW’s meticulously sampled fretboard with your MIDI controller, complete with dead notes, full stops and satisfying slides. Virtual Bassist MELLOW – at the heart of it is a meticulously recorded acoustic double bass, played with soul and feel, implanted in a virtual instrument adding realism, behavior and a player who knows his stuff. Smooth, elegant, with the odd noise here and there. At home as a subtle foundation in a jazz trio as well as a powerful second voice in hiphop. Forget double bass as you know it – Mellow goes beyond.